Some of the terms used in describing houses can be confusing to say the least. Here are some pictures to help you get acquainted with your home, and the parts that we refer to in our Standards Manual. Some of our Leewood Homes have shutters around their doors, others have the trim shown to your left here. The triangular part is called the pediment. The center piece which is often a stylized pineapple is called the Finial. 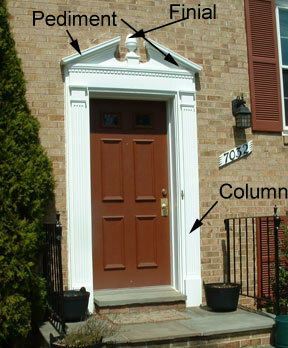 There are columns on either side of the door. 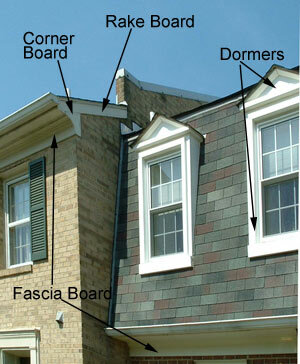 Fascia Boards are the vertical boards on a house, and soffits are horizontal. On the interior units there are attic vents placed within the soffit. These are necessary for the ventilation of your attic, and you should try to keep your painter from stopping up the air passages in the vents. Some vents have been replaced as they were no longer working, and may not look like the ones in the picture. 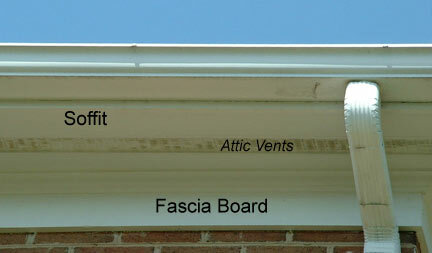 This is another view of a fascia board. There are rake boards of various lengths on our houses.They are easy to miss when inspecting your house for painting as sometimes you have to stand quite a distance away to see your rake board -- particularly in the back of your house. As the exposure is different from the main painted part of your house, the paint breaks down at different times. The corner board finishes off the rakeboard. Some houses have dormers, which are prone to rot and must be watched carefully. Some people have used a more resistant wood substitute in this area. 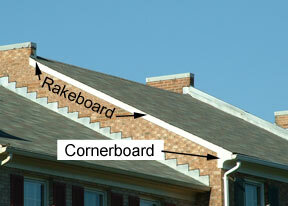 As mentioned earlier, some rakeboards can be quite long, extending the whole length of the roof. Also, another view of the cornerboard. Sometimes if your rakeboard and cornerboard need painting, you can get a painter working on a neighbor's house to paint your board for a nominal fee. It helps if you have a can of paint with you!